The school where Ms. Geranium teaches, which also happens to be our neighborhood school (both of our kids went there), does a monthly coffee fundraiser. Basically, parents, teachers and anyone else who wants to can order coffee from Just Coffee™, a local organic, fairtrade coffee wholesaler. The school gets to keep a percentage of the sales and people get to help the school by buying something they would probably be buying anyway. It's more or less a win-win situation. The only catch is that a) someone has to organize the whole thing (that would be Ms. Geranium) and, b) someone has to pick up the order, divide it up and deliver it to the appropriate places, mostly classrooms. That job usually falls on me, in large part because if I don't do it, Ms. Geranium will have to and she actually has a job. Even before I joined the ranks of the unemployed, I would usually take an extended lunch break to make the delivery, but now that I'm not working, it's that much easier. Today was delivery day. I enter the school, sign in and start my rounds. Of course, first stop is Ms. Geranium's room, partly because it pleases me to begin and end at her room and use it as a base station for my operation, but also because many people don't fill in the "Your Child's Room Number" part of the form, and I can ask her "what room is Bizktrygdslynka Qlakwiczpgglfggl in?" (Many parents don't seem to have the knowin' of the writin' good these days.) I also enjoy saying hello to the kids in the school, some of whom were once in Ms. Geranium's kindergarten or first grade class and are now fifth graders. It's also nice to see the members of the staff who I may know as former teachers of my kids, or, in the case of one teacher, is a former band-mate of mine. The kids always greet me enthusiastically -- "Hi, Mr. Ed" or "Hi, Coffee Man." Sometimes they all crowd around saying "I like coffee! Can I have some coffee?" or "Are you Ms. G.'s husband?" Once (and I'm sure this made Ms. Geranium feel quite good) a kid asked "Is she your mom?" As I was arriving with the coffee, one of Ms. G.'s kids ran up and said "I made a picture for you!" On the right, there is a tree with a monkey in it. 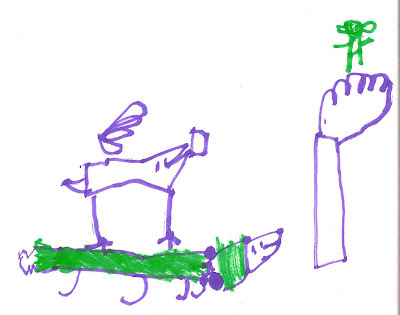 To the left, there is a crocodile with a fox riding on its back. The fox is carrying bananas on its back and a book in its mouth. It all has something to do with a story about how the fox and the monkey somehow tricked the crocodile into carrying the fox somewhere to get bananas for the monkey. I suspect the crocodile probably intended to eat the fox and/or monkey, but that's pure speculation on my part. Anyway, I was quite touched. One of the positive aspects of being un- or under-employed has been the opportunity to be a part of the school community, if only in a very small way. I always get a kick out of it. That kid is a great artist for drawing a monkey picture. I have to add to this story that when he walked into my room carrying a big box, he was mobbed by my students saying, "What's in the box?" to which he replied in the fashion our children have come to know and love, "Baby elephants." One of them gave him a LOOK, and then said, rather disgustedly, "No, it's coffee." That's sweet! I'll bet the kids love having you come by even if you don't bring baby elephants. At least you can do this in your school district. Parents aren't allowed to volunteer in classrooms here. There was a coterie of mothers a few years back who decided, with the full cooperation of a few teachers at one of the grade schools, that their children deserved extra attention every day. So they organized pull-outs with advanced reading, writing and math conducted by the parents. But only for their children. Once word of this got out, there was a real stink. The PTO meetings were riotous. So, now, parents aren't allowed in the classrooms except for conferences. Rather than surgically excise the cancer, they chopped off the limb. I'd love to see the kind of healthy school atmosphere you describe, Ed, but I've never seen it here. You're a lucky man. This post and the comments really made me smile today.